Elite Gaming. Schenker has a desktop replacement uncompromisingly made for performance in its product line called XMG U700 ULTRA. A strong Core i7 processor and two GeForce GTX 489M graphics cards are to teach the gaming competitors the meaning of fear. 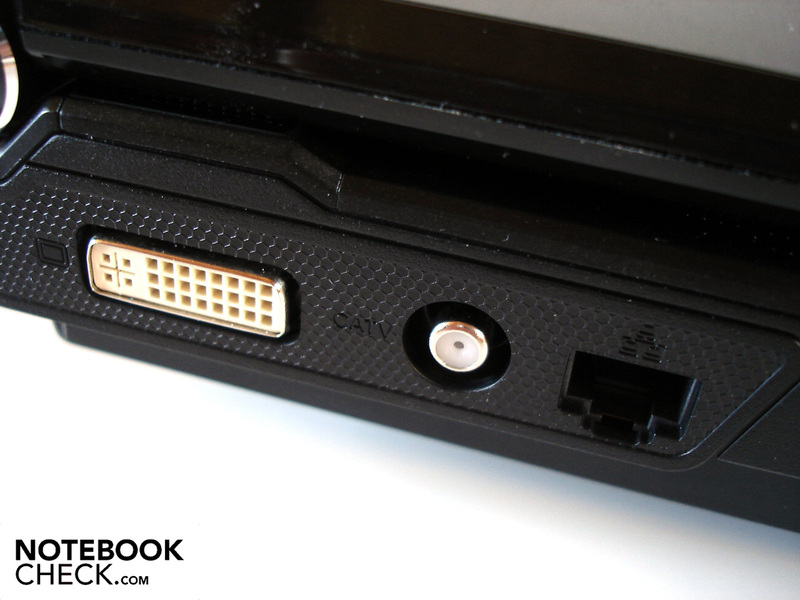 There is a vast amount of 17" gaming notebooks, but most manufacturers don't offer a detailed configurability. 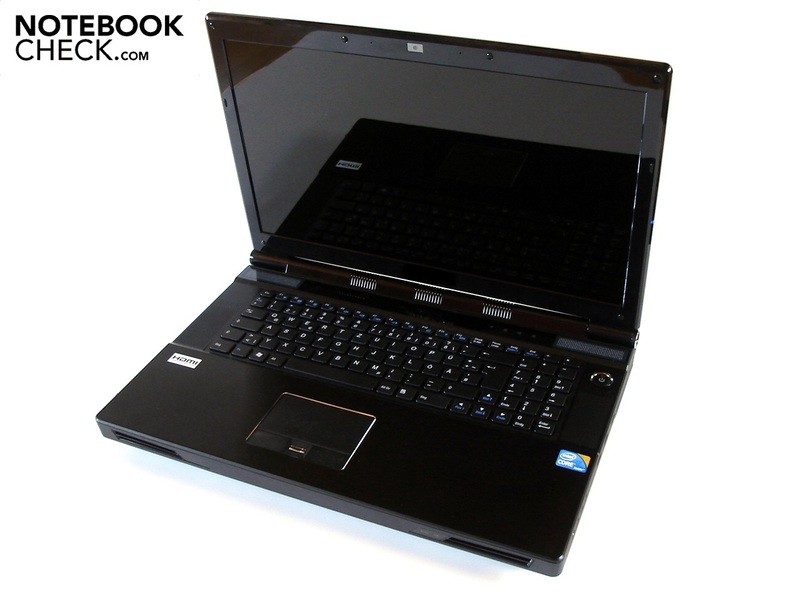 Unlike Schenker notebooks, where the XMG U700 ULTRA can be modified in many ways to suit individual needs. The potential buyer is already spoiled for choice with four options for the graphics card. A single GeForce GTX 460M, respectively GTX 470M or a SLI combination of two GTX 460M or GTX 470M GPUs provide even the most demanding gamers enough graphics power. The processor matches this in every way. A strong quad core from the Core i7 series (i7-950 - i7-980X) or a hexa-core from the Xeon range (X5660 & X5680) supply desktop performance in the notebook division. It goes on with the operating memory, where two up to a maximum of twelve GB of DDR RAM are waiting to be configured by the customer. Since the memory prices are currently very low, an according upgrade doesn't burden the wallet too much. The hard disk arrangement is unusual. The barebone with dimensions of 419 x 286 x 73 millimeters and a weight of almost six kilograms can take up to three hard disks. Aside standard HDDs with a capacity of 250 to 750 GB (5400 & 7200 rpm), Schenker also offers swift SSDs (40 - 256 GBs) and innovative hybrid models (320 - 500 GBs). If you rather store data externally, you'll also be perfectly served. 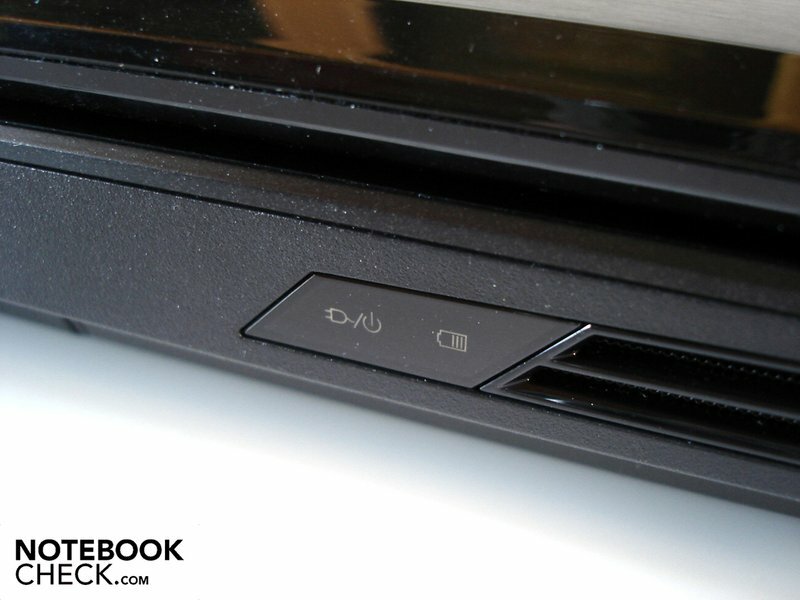 Aside a DVD burner and a Blu-Ray player (burns CDs/DVDs), there is also a Blu-Ray burner available. 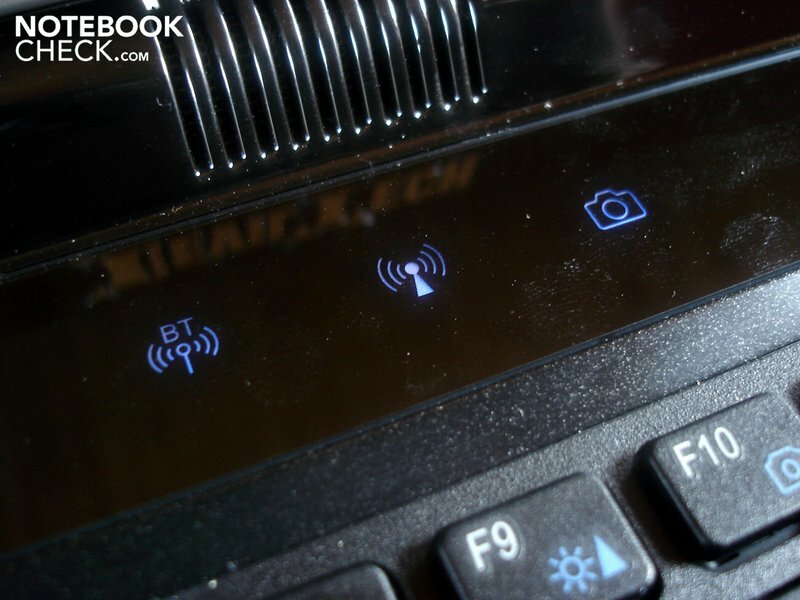 Wireless communication looks as follows: While Bluetooth version 2.1 is installed standardly, WLAN costs extra. The XMG U700 ULTRA is even suitable as a TV replacement. For a surcharge, a TV card (DVB-T + analog) is available. As a rule, Schenker omits an operating system. Windows 7 Home Premium, Professional or Ultimate (32 & 64 bit) are only installed if required. However, the high performance components want to be paid for first: Schenker charges a whole 1699 euro for the basic configuration. Our test device with a Core i7-950, GeForce GTX 460M SLI, twelve GB of DDR3 RAM, a 64 GB SDD, two 640 GB HDDs, Blu-Ray burner, WLAN and Windows 7 Home Premium 64 bit added up to a steep 2551 euro. However, it really gets expensive with the maximum configuration. Certainly, not everyone will have almost 6000 euro in their wallet. If you don't want an extensive configuration, you can also get the XMG U700 ULTRA via Internet shops, Amazon.de or Notebooksbilliger.de. Cooperation with Schenker makes it possible. 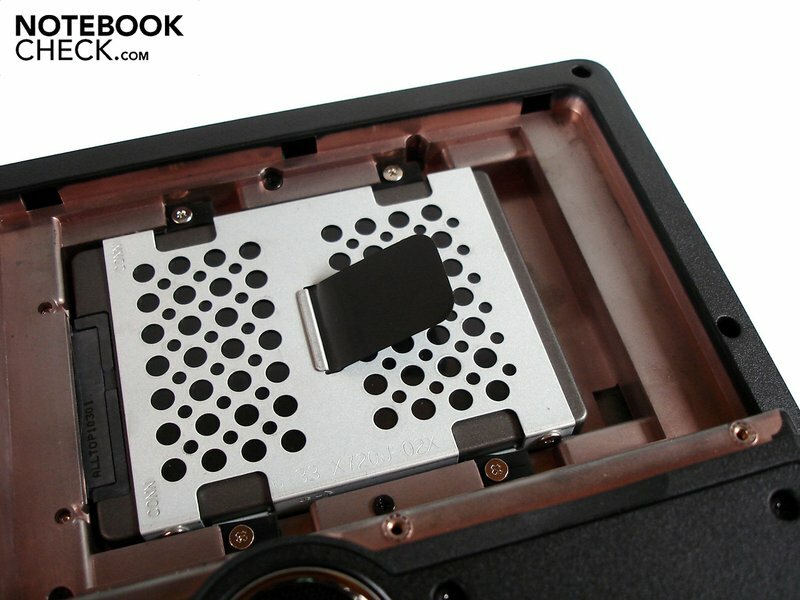 Since we've already examined the Clevo X7200 barebone as HellMachine DTX from DevilTech comprehensively, we would like to refer you to the correlating review for the parts about case, connectivity and input devices for more information. The high-end display is one of the XMG U700 ULTRA's biggest advantages. 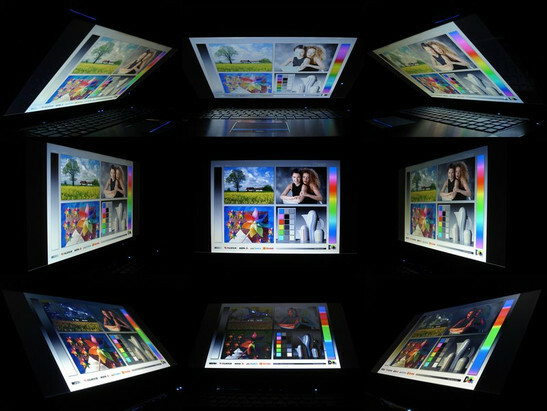 The 17.3 inch Hannstar HSD173PUW1 glare screen can serve with an aspect ratio of 16:9 and an LED backlight. 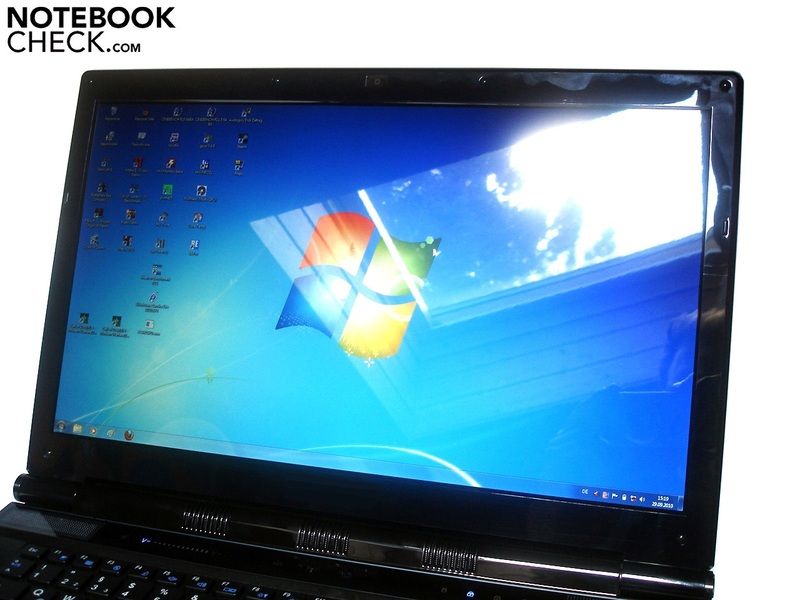 The notebook pleasingly has a lot of desktop room due to a display diagonal of 43.94 cm and a resolution of 1920x1080. Working with simultaneously opened windows is very comfortable. The display leaves the competitors far behind in terms of rates. Black areas really look deep black and don't drift into gray because of the low black value (0.15 cd/m2). The contrast of 1080:1 also has to be described as outstanding. The image makes an very differentiated impression. The colors don't have to hide, either. Fitting attributes are saturated and natural. Merely the brightness could be higher. 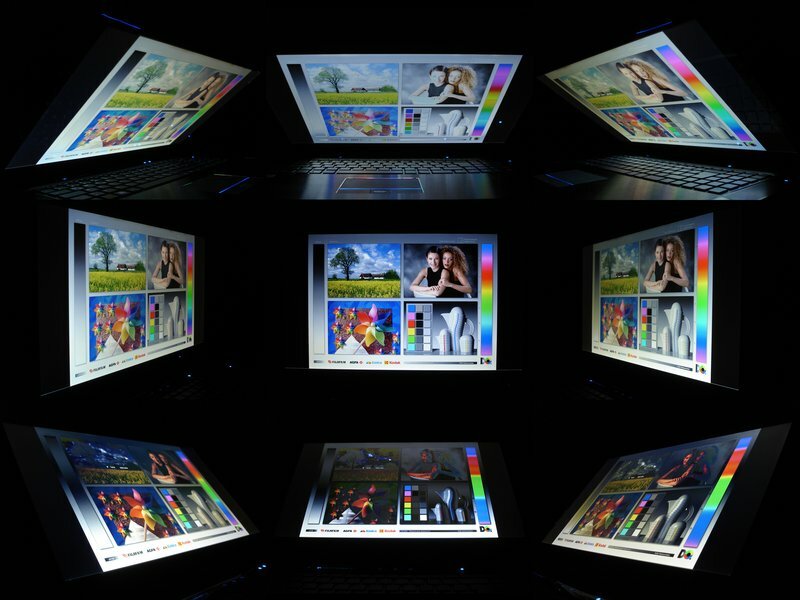 The brightness is fully sufficient for office and internet tasks with an average of 177.8 cd/m2. In return, games and movies noticeably lack brilliance. The display can however compensate this flaw with its good interpolation capabilities. The image hardly blurs when the resolution is reduced moderately. A drawback of the glossy display surface is the high susceptability for reflections. Due to the high weight and vast dimensions, most users won't likely consider outdoor use. However, annoying reflections even occasionally turn up indoors when the notebook is positioned unfavorably. Darkening the room can remedy this during the day. 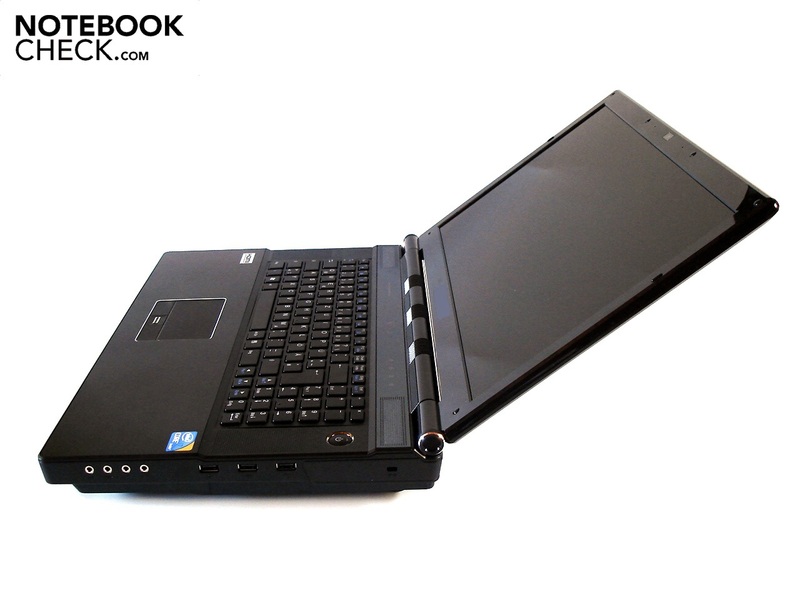 In opposition to many other notebooks, the viewing angles hardly give reason for complaint. The image stays surprisingly stable even under larger deviations. Falsifications sooner turn up vertically, especially from the lower corner. Nevertheless, the display rarely has to be readjusted. 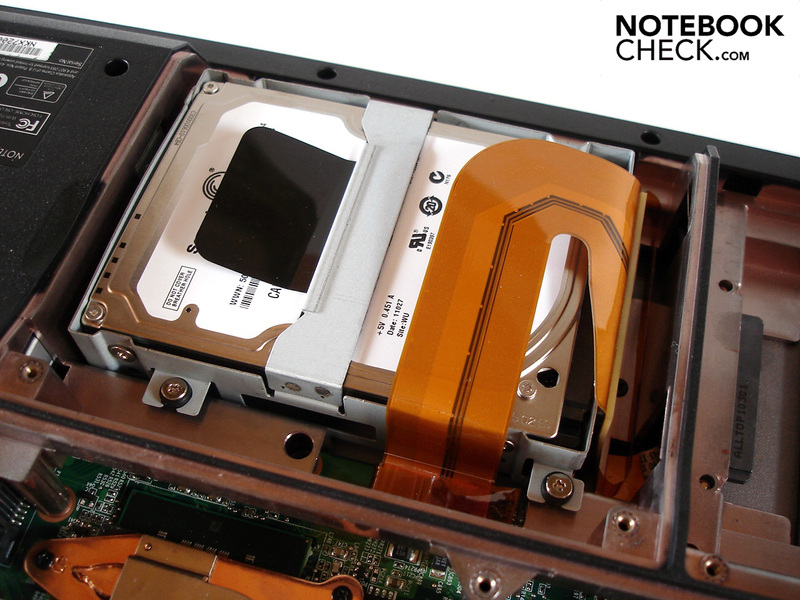 Before we look at the single components and their performance, an important note has to be made: The test device that we were provided with had to struggle with numerous, partly critical problems. They were mainly error messages and complete system freezes during the installation, booting or running programs. According to Schenker, the reason is to be found in the installed four GB RAM modules and the applied bios. Since Schenker states that it now uses different RAM modules and an updated bios, these problems shouldn't be encountered in newer devices. A highlight of the XMG U700 ULTRA is the utilization of a desktop CPU from Intel's Core i7 or Xeon range. 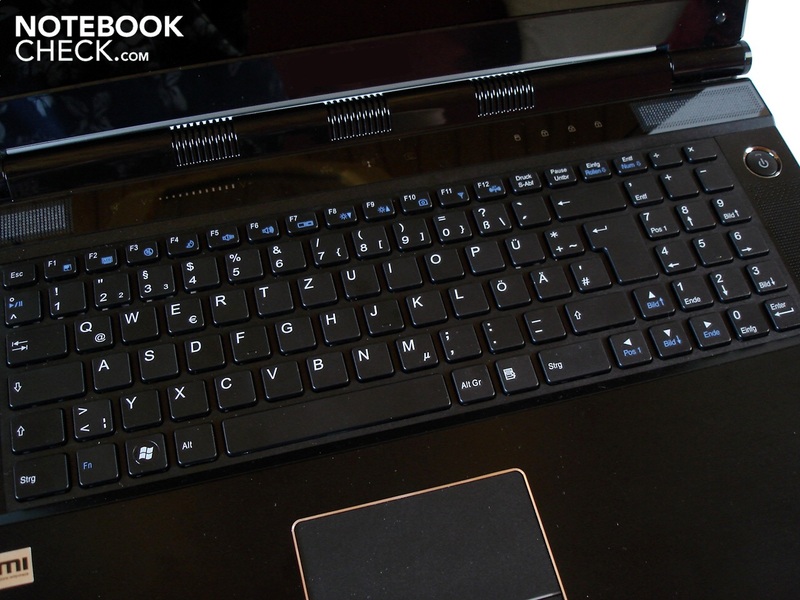 Schenker equipped our device with Core i7-950. The quad core processor, manufactured in a 45nm structure width, for the high-end base 1366 (X58 mainboard) belongs to the currently fastest processors on the market. It has an eight MB L3 cache and a clock rate of 3.06 GHz. The Core i7-950 is able to process up to eight threads at the same time due to Hyperthreading technology. While modified applications clearly benefit from hyperthreading, games hardly run faster (yet). Naturally, the well-known Turbo Boost technology shouldn't be omitted. As long as the core capacity and temperature situation allows it, the clock rate is automatically lifted up to 3.33 GHz. The gigantic raw performance has its price: The power consumption of 135 watts TDP is extremely high and clearly positions itself above mobile Core ix CPUs. 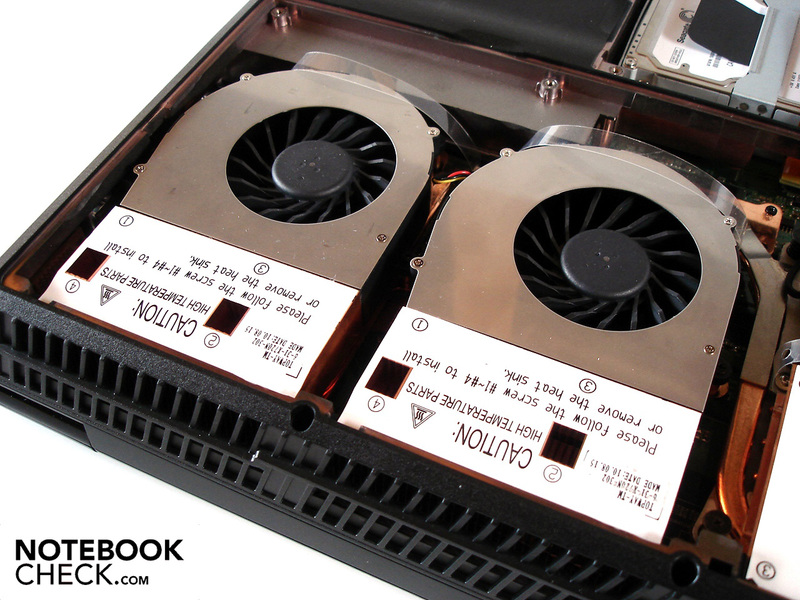 For example, the favored Core i7-720QM treats itself to three times less energy with 45 watts. The Core i7-950's outstanding application performance not least becomes evident in the benchmark program, Cinebench R10 (64 bit). Since the Turbo Boost function usually stays enabled in multi core rendering, the Core i7-950 can distinguish itself from the mobile Core i7-720QM by an awesome 78% (17817 to 10000 points). The distance narrows noticeably in multi-core rendering. The Core i7-950 is still in the lead by "only" 19% with 4381 to 3691 points. Both graphic cards are the heart of the XMG U700 ULTRA. Two GeForce GTX 460M graphics cards work in performance boosting SLI mode. The GeForce GTX 460M is based on Nvidia's promising Fermi architecture and is manufactured in a cutting edge 40nm process. The GeForce GTX 460M belongs to the fastest mobile graphics accelerators with 192 unified shaders and a 1536 MB GDDR5 memory. The memory interface proves to be sufficiently sized with 192bits. Even the clock rates of 675 MHz (core), 625 MHz (memory) and 1350 MHz (shader) are impressive. The graphics card can also collect additional bonus points with the vast amount of supported features. Aside GPU based physical calculations (PhysX), dynamical GPU switching (Optimus, not implemented), stereoscopic 3D representation (3D vision, needs corresponding Kit and 120 Hz monitor), the GeForce 460M additionally is capable of DirectX 11. In the following, we would like to deal with the drawbacks of a dual GPU configuration. A significant problem of SLI is the so-called micro stutters. The intervals between the single frames that are calculated alternately from both graphics cards vary in the currently utilized process. This sometimes leads to subjective stutters, especially under frame rates of 30 fps. Because a GeForce GTX 460M combination easily manages even demanding games in high resolutions and graphics settings, micro stutters are a rather rare occurrence in the XMG U700 ULTRA. SLI's second drawback is the high driver dependency. There is only a minor or complete lack of performance gain if a game or the GPU driver isn't optimized for a second graphics card in the worst case. Waste heat and power consumption (up to 150 watts) shouldn't be ignored either. These factors only make an implementation in large, well-conditioned cases possible. The GeForce GTX 460M SLI had to face its crossfire opponent from AMD/ATI, the Radeon HD 5870 X2 (DevilTech HellMachine) in the graphic biased benchmarks. 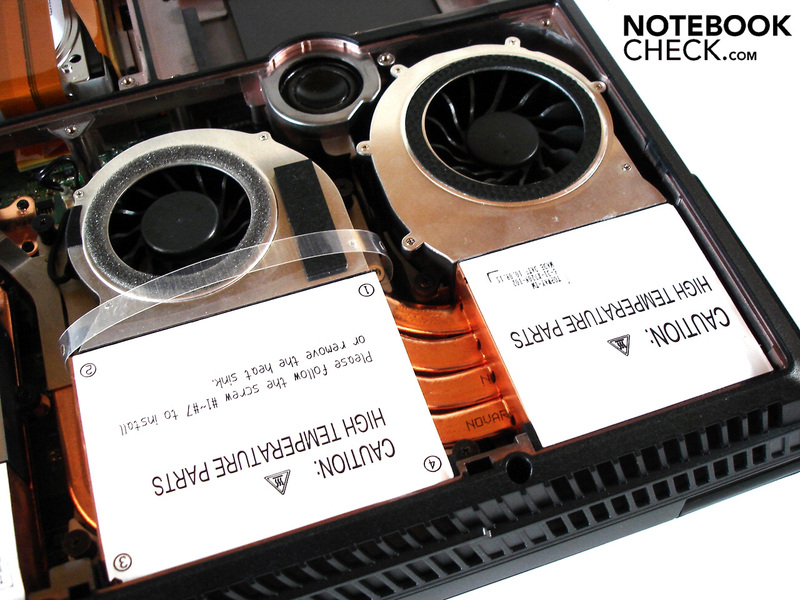 The Radeon HD 5870 X2 can place itself a bit in front of the GeForce GTX 460M in the no longer new 3DMark 03. 63595 to 61524 is a difference of 3%. However, the tide already turns in 3DMark05 and the GeForce GTX 460M clearly takes the lead with 25371 to 19079 (+33%). The GeForce GTX 460M maintains its high level in 3DMark06. The difference is now 31% with 18583 to 14188 points. The Radeon HD 5870 X2 can again close in again in 3DMark Vantage's GPU score (13021 to 13156 points). Aside from Futuremark's 3DMarks, a benchmark made for testing DirectX 11 to the extreme, Unigine Heaven 2.1, also serves us a comparison basis. Due to its low number of tessellation units, the Radeon HD 5870 X2 doesn't really stand a chance against the GeForce GTX 460M SLI. The latter has the lead by 11% with 47.2 to 42.5 fps (1280x1024, high, tessellation: normal). Another highlight of the X7200 barebone is the option of a configuration with up to three hard disks. Schenker has naturally not missed out on this opportunity and equips our test device lavishly. Starting with a small 64 GB SSD that does its job as system partition. The RealSSD C300 from Crucial not only can score with an outstanding access rate of 0.2 ms, but at the same time has a very good transfer rate of 178.2 ms on average (HDTune). The sequential read rate (275.3 MB/s) is alike the sequential write rate (75.85 MB/s) also on a high level (CrystalDiskMark). The SSD doesn't show any signs of weakness even with small files. 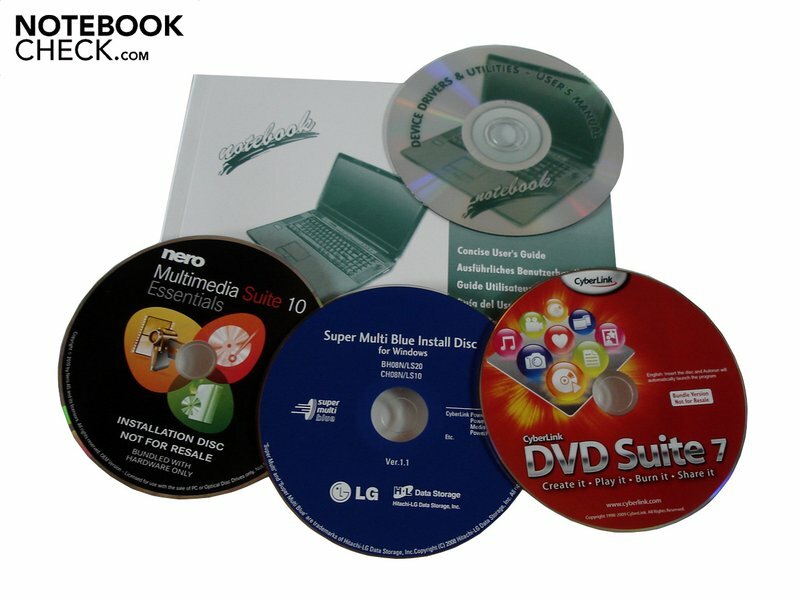 Overall, the operating system and program boot, start and load times are pleasantly short. The XMG U700 ULTRA responds extremely fast. Both Seagate Momentus 5400.7 HDDs (5400 rpm with 640 GB each can be considered as a good complementation and supply a lot of memory capacity. The hard disks can almost reach the SSD level (at least with larger files) due to its setup as RAID 0. A sequential read rate of 163.8 MB/s and a sequential write rate of 146.8 MB/s and a average transfer rate of 139.6 MB are clearly superior to single HDDs. The XMG U700 ULTRA's application performance has earned itself the title "stunner". No matter how demanding an application might be, the combination of Core i7-950, GeForce GTX 460M SLI and SSD hard disk is throughout awesome with an extremely high performance, and the one or other full-fledged gaming PC won't be able to keep up with it. The best proof of this is PCMark Vantage's rating. An enormous 13294 is by far the best result we have ever measured on a notebook. Beside the pure performance, the upgradability is convincing. Three hard disk slots and a maximum of 12 GB RAM grant a very high future proofness. To find out how the GeForce GTX 460M SLI will manage in comparison to its wickedly expensive high-end sibling, GeForce GTX 480M SLI (surcharge of 500 euro) and ATI's on par counterpart, Radeon HD 5870 X2, we let the XMG U700 ULTRA compete against the HellMachine and the HellMachine DTX from Deviltech. We will only deal with the results in the FullHD resolution of 1920x1080 in this section, because the CPU's impact would be too major. At the end of every game, we will additionally illustrate the performance difference to a single GeForce GTX 460M briefly. As you will see in the run of our benchmark course, most current tracks only elicit a tired smile from the GeForce GTX 460M. Mafia 2 also runs pleasantly smooth in very high details, 16x AF and a resolution of 1920x1080. 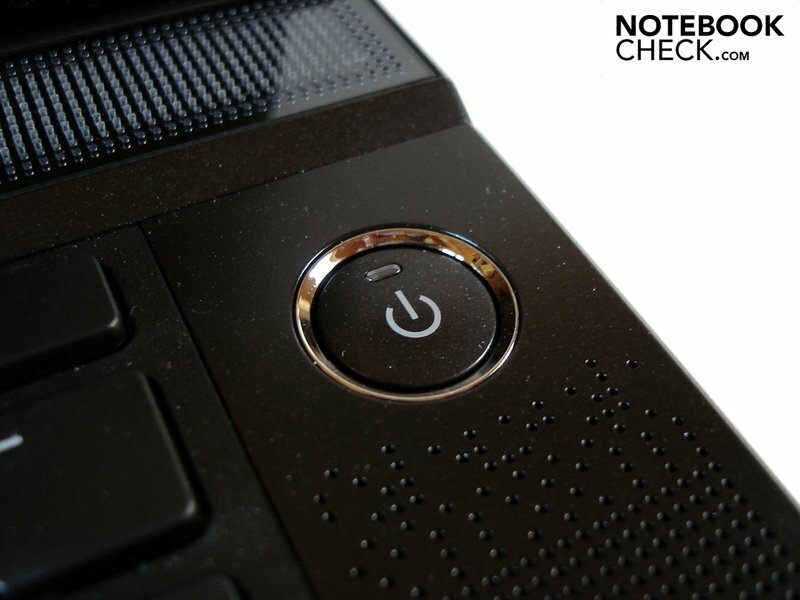 The majority of notebooks can only dream of 66 fps. The GeForce GTX 460M SLI positions itself exactly between the Radeon HD 5870 X2 (56.8 fps) and the GeForce GTX 480M SLI (75.8 fps) with this frame rate. The extremely successful real-time strategy hit, Starcraft 2, was the only game in our list, where the Radeon HD 5870 X2 could set itself apart from its Nvidia opponents. It could beat the GeForce GTX 460M SLI (40.8 fps) and the GeForce GTX 480M SLI (42.5 fps) by 10 fps with 51.2 fps 1920x1080, ultra details). The exorbitant hardware requirements of the atmospheric first person shooter, Metro 2033, even forces the GeForce GTX 460M SLI to its knees. You shouldn't even consider a smooth image setup due to a meager 18.5 fps in high details (AAA & 4 AF), the DirectX 11 mode and a resolution of 1920x1080. The Radeon HD 5870 X2 (18.0 fps) and GTX 480M SLI (23.1 fps) can't promise an acceptable game play in the according setting either. We will limit ourselves to a comparison with the GeForce GTX 480M SLI in the realistic-inspired Need for Speed offshoot, because the Radeon HD 5870 X2 presented an erroneous performance. Neither the GeForce GTX 460M SLI nor the GeForce GTX 480M SLI had serious problems when high details, 4x AA and a resolution of 1920x1080 were used. There is nothing standing in the way of an appropriate chase for your personal best with 81.6 fps, respectively 93.0 fps. While numerous gaming notebooks have massive problems with the graphics heavy multi-player shooter, the XMG U700 ULTRA feels very comfortable. With 56.7 fps, the GeForce GTX 460M SLI lags slightly behind the Radeon HD 5870 X2, which achieves 57.7 fps, in a resolution of 1920x1080, high details and 8x AF. Both graphics combinations loose against the GeForce GTX 480M SLI. Our current reference rate is 64.7 fps. If you like role games in a freely accessible world, Piranha Byte's Risen will be just right for you. The German role game suits the GeForce GTX 460M very well. We determined an outstanding 63.5 fps in a resolution of 1920x1080 and high details. The Radeon HD 5870 X2 places itself marginally below this result (62.5 fps) and the GeForce GTX 480M SLI skillfully takes the lead (70.9 fps). The now slightly older Modern Warfare 2 doesn't present a big task for the XMG U700 ULTRA. The frame rate settles to a high two digit area even in high details, 4x AA and a resolution of 1920x1080 (88.3 fps). Thus, the GeForce GTX 460M SLI has a greater tendency to the GeForce GTX 480M SLI (90.3 fps) than the Radeon HD 5870 X2 (81.4 fps). As known, the fancy race game, Dirt 2, harmonizes very well with graphics cards from the GeForce 400 series. Therefore, it's not surprising that the GeForce GTX 460M SLI (75.4 fps) and GeForce GTX 480M SLI (81.3 fps) place themselves clearly in front of the Radeon HD 5870 X2 (56.6 fps) in the FullHD resolution, very high details and 4x AA. Besides Metro 2033, Crysis was the second game that showed the XMG U700 ULTRA its limits. The GeForce GTX 460M SLI crept along with a moderate 25.4 fps in very high details and a resolution of 1920x1080. Both the Radeon HD 5870 X2 (29.7 fps) and GTX 480M SLI (30.9 fps) can provide a higher performance in this case. The XMG U700 ULTRA presented an excellent performance in practical gaming. The GeForce GTX 460M SLI neither has a problem with maximum details nor with FullHD resolutions in current games. Demanding tracks, such as Metro 2033 or Crysis, are an exception. The user doesn't have to forgo on performance draining quality enhancements (e.g. antialiasing), either. Beyond that, Nvidia has also earned praise for the surprisingly well optimized driver (ForceWare 259.51). The performance gain with a second GeForce GTX 460M was usually more than 90%. SLI was superior to a single GPU by a remarkable 86% on average. The good driver also is the reason that the Radeon HD 5870 X2 ultimately falls back, although it's actually slightly superior. The GeForce GTX 460M SLI calculates faster by a whole 8%. Incidentally, we consider the GeForce GTX 480M SLI to be superfluous since the GeForce GTX 460M has been launched. About 500 euro extra for just only 11% more performance is definitely not worth it. In our opinion, the GeForce GTX 460M SLI is absolutely THE dual GPU system for performance enthusiasts. ATI can't quite keep with it at the moment, due to its less successful driver. By the way, Nvidia has another interesting ace up its sleeve. A few manufacturers are already listing GeForce GTX 470M (SLI). The high system noise is the XMG U700 ULTRA's biggest drawback. The four case fans already turn up when the notebook is turned on. As soon as the operating system has booted, the fan noise is reduced noticeably. Nevertheless, the 17 incher is audible at all times. The noise level is only moderate under load. At least, louder sections of games aren't drowned out. The desktop replacement first presents itself as disturbingly loud under full load. A rate beyond 50 dB(A) speaks for itself. Basically, noise sensitive users should avoid the XMG U700 ULTRA. 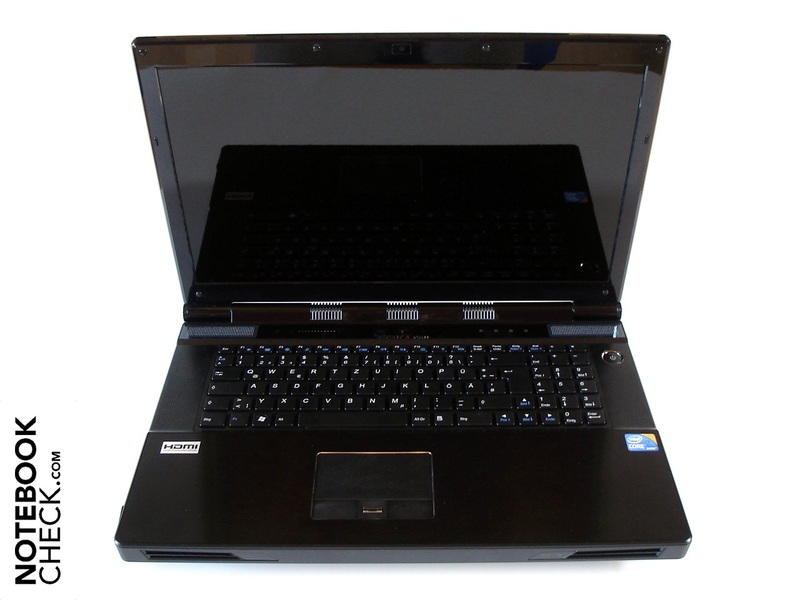 Other gaming notebooks, such as Asus G73JW, operate significantly quieter. As it's usual for a desktop replacement, the case surfaces heat up fairly intensely under load. We measured up to 42.6°C on the bottom and up to 45.4°C on the top during full load via the tools Prime and Furmark. In return, the wrist-rest stays fairly cool with a maximum of 33°C. The temperatures are generally impressive in idle mode. About 30°C don't give reason for complaint. Let's take a peek inside the case. Both the graphics cards (~40°C) as well as the processor (~46°C) prove to be adequately tempered in idle mode. Particularly the processor heats up under full load. 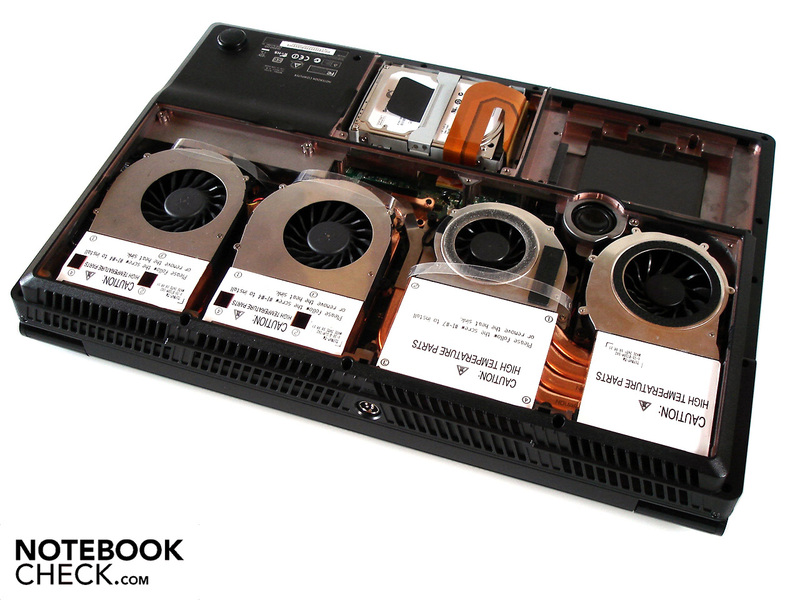 While both GeForce GTX 460M GPUs achieve a maximum of 68°C, respectively 76°C, the Core i7-950 heats up to over 90°C. Due to that, the CPU temporarily clocks down to a low 1.60 GHz. Although the XMG U700 ULTRA theoretically has a 5.1 sound system (five loudspeakers + 1 subwoofer), merely two speakers emit a sound in our test device. We would describe the sound quality as good. All pitches are rendered fairly balanced and precise (even if a bit muffled). The bass is at least indicated, but a bit more presence wouldn't have hurt. We liked the high maximum volume the most. 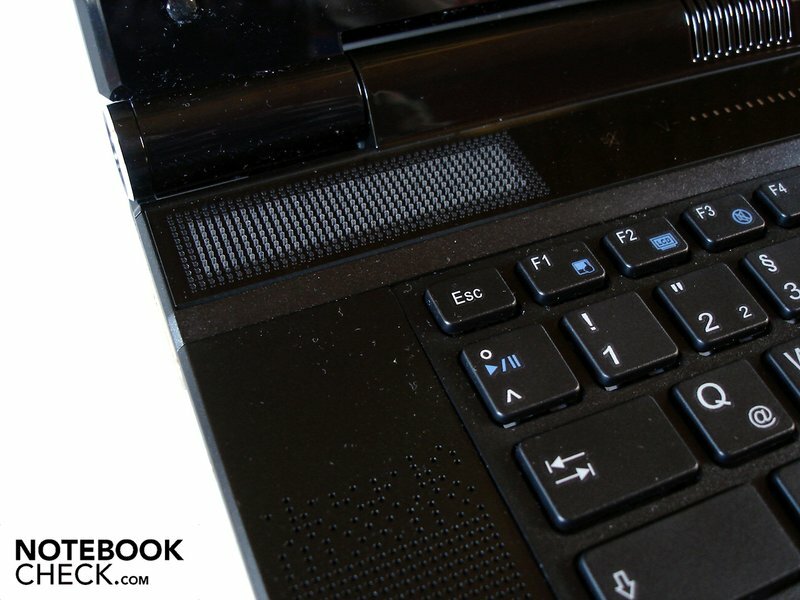 Hardly another notebook can be turned up so loud. 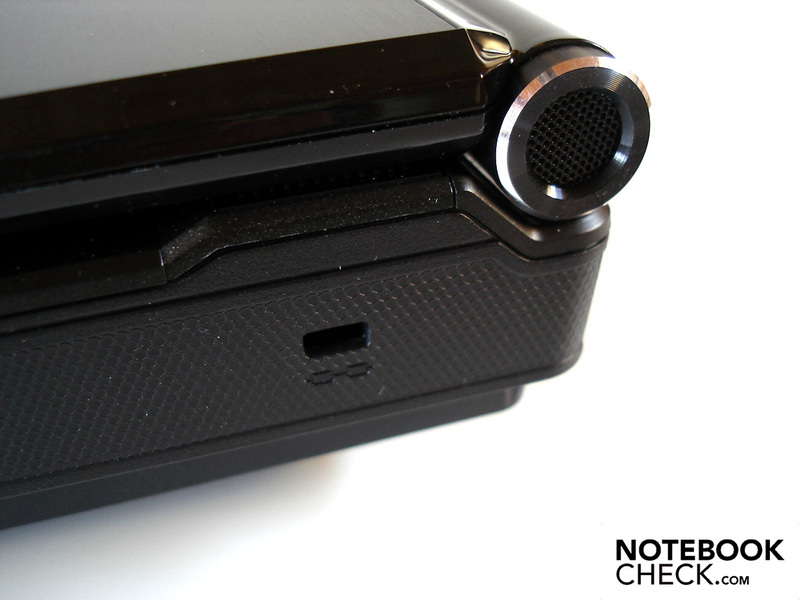 All in all, external loudspeakers aren't really a must, but we would prefer a separate sound system in the long run. Unsurprisingly, the XMG U700 ULTRA's mobility is extremely limited. The 17 incher already bids farewell after just only 61 minutes under ideal conditions (low load, maximum energy savings, minimum brightness). DVD playing is also no fun remote from the mains. The actually strong lithium ion battery (78.44 Wh) was drained after 48 minutes with maximum brightness and moderate energy saving options. The battery life only caves in slightly under load. We determined a poor 42 minutes in BatteryEater's Classic test (maximum brightness, disabled energy saving options). If SLI is active or not doesn't play a role in battery life. 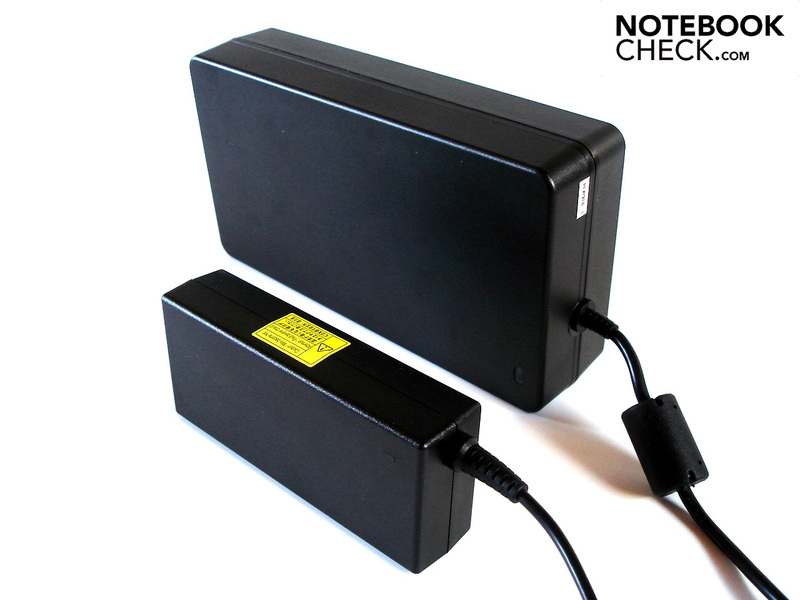 The low battery runtimes are primarily induced by, for notebook terms, the exorbitant power consumption of the high performance components. 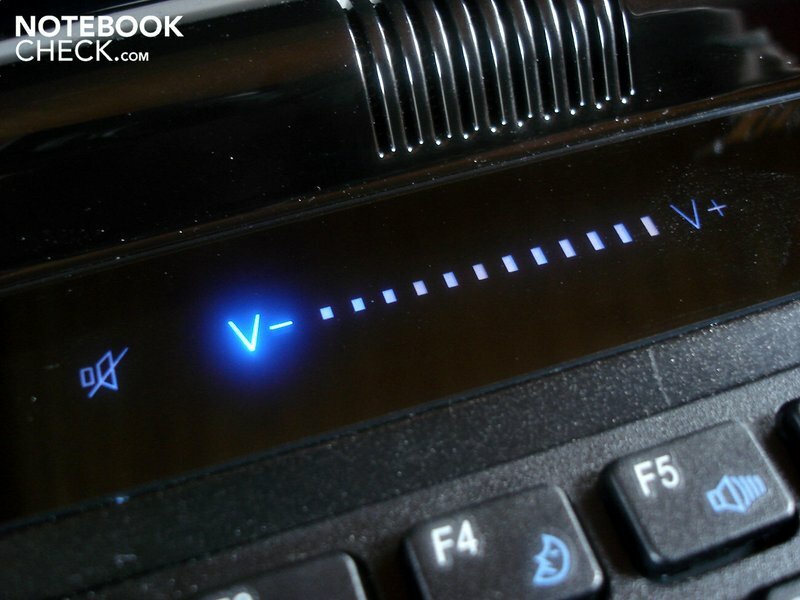 Other gaming notebooks, such as the DevilTech Fragbook DTX, are clearly surpassed with 73.5 - 80.7 watts in idle mode and 207.3 - 339.0 watts under load. Even DevilTech's 18.4 inch HellMachine with Radeon HD 5870 X2 treats itself to significantly less energy due to the mobile Core i7 CPU. 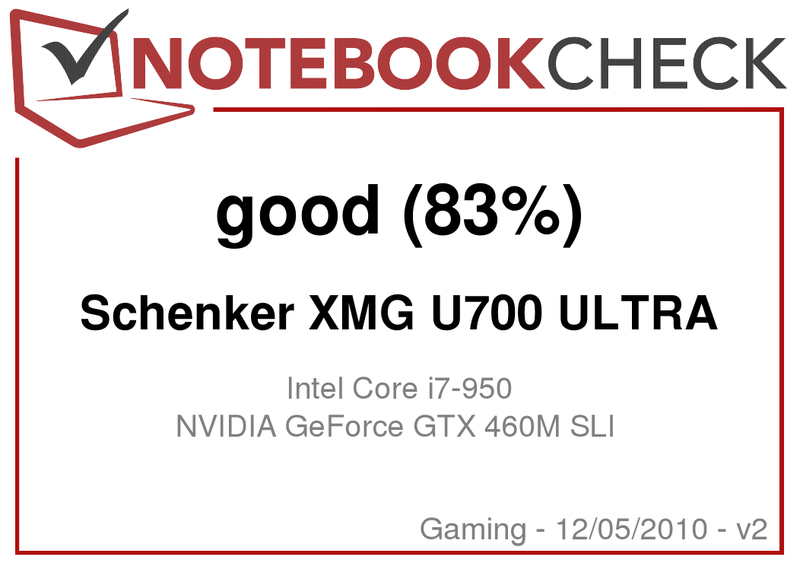 The XMG U700 ULTRA is definitely a top notch notebook. Desktop processor, two graphics cards and three hard disks: The 17 incher is the prime example of a full-fledged desktop replacement. 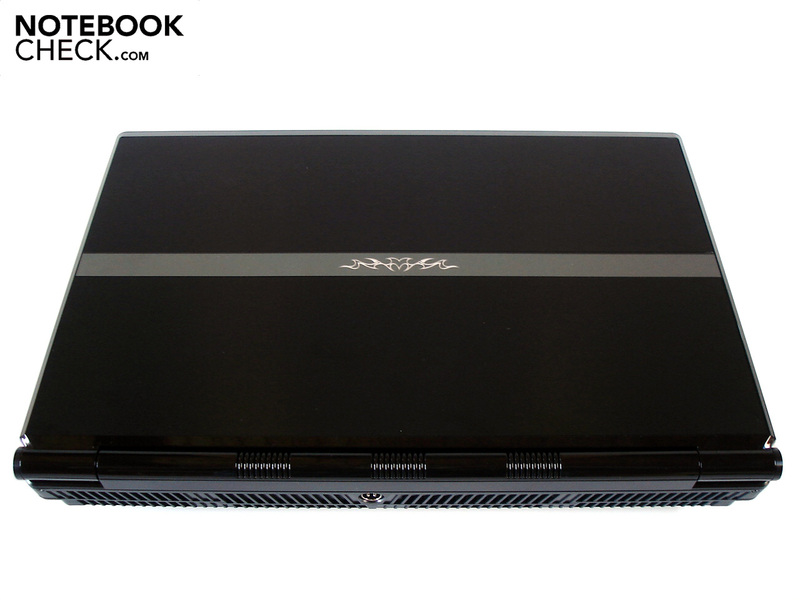 The well manufactured X7200 barebone from Clevo is extremely bulky and heavy. 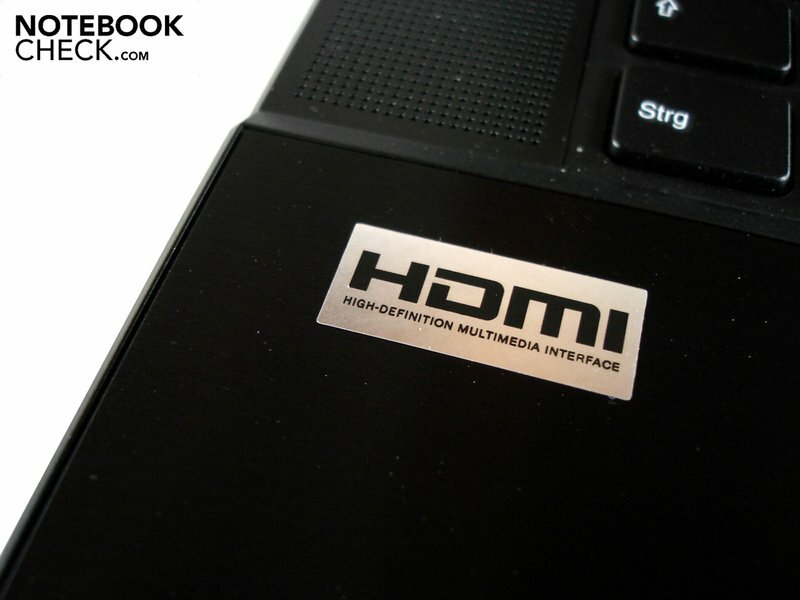 In return, it delights with a lavish connectivity, a crisp keyboard and a high quality display. The biggest unique feature is likely its gigantic performance: Both GeForce GTX 460M graphics cards in combination with Intel's Core i7-950 supplies awesome application and gaming performance, which are usually only known from desktop PCs. Regrettably, practical use is dimmed by a very high system noise. The fans are always very audible. 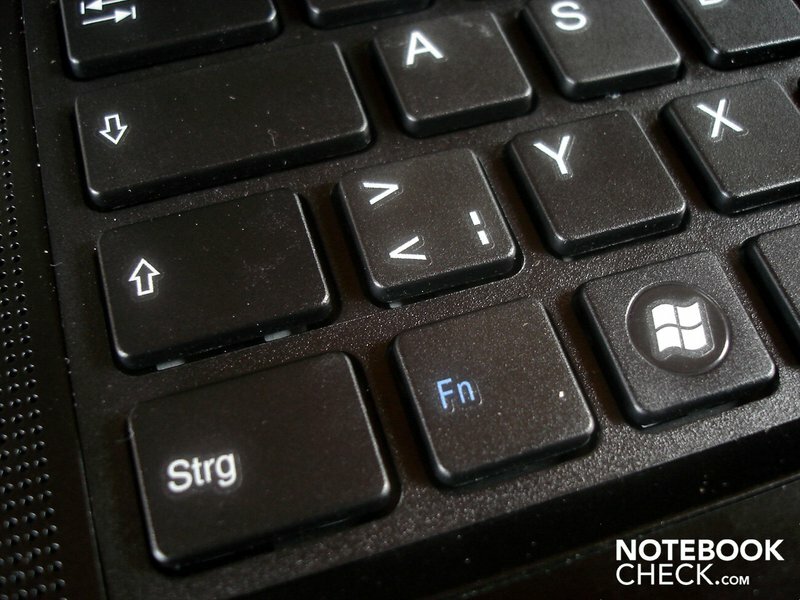 Mobility is also a foreign word for the notebook. Aside the heavy weight and size, the poor battery life with a maximum of one hour is disagreeable. Overall, the XMG U700 ULTRA is made for well-to-do and noise resistant performance enthusiasts, who want to call a as strong as possible desktop replacement their own. The 17 inch desktop replacement almost weighs six kilograms. 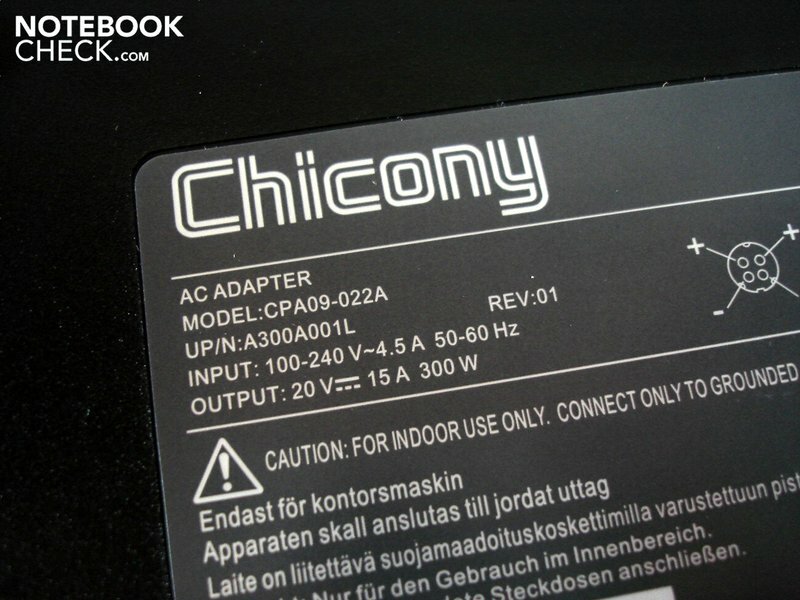 A 300 watt adapter takes care of the power supply. There is a subwoofer on the case's bottom. 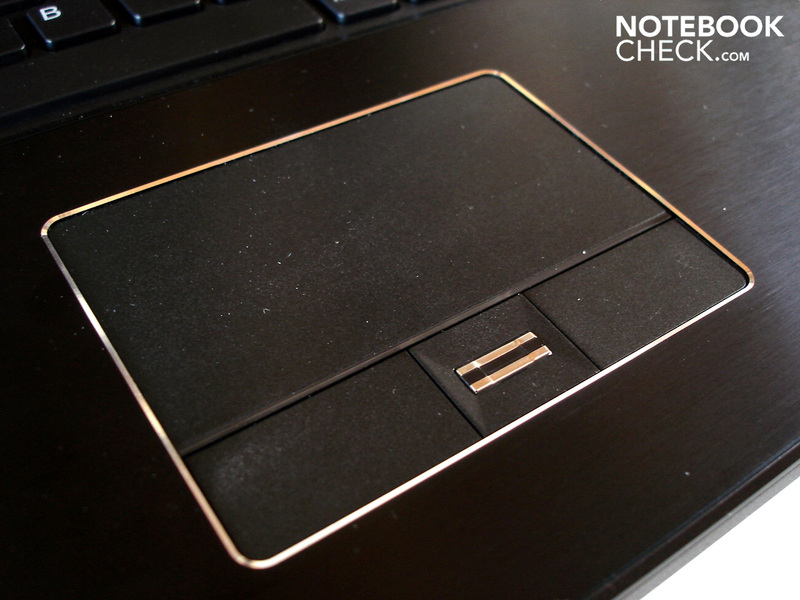 A fingerprint reader is placed between the touchpad keys. 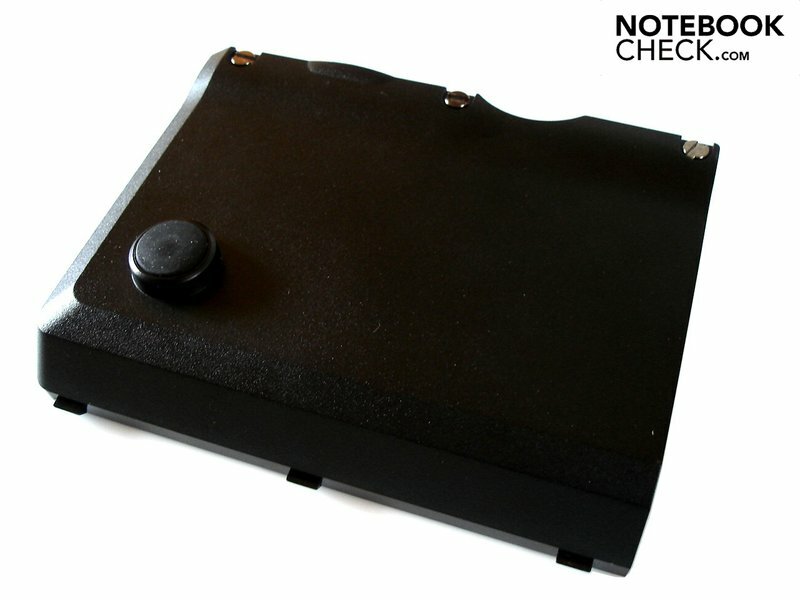 The touchpad's surface is slightly roughened. 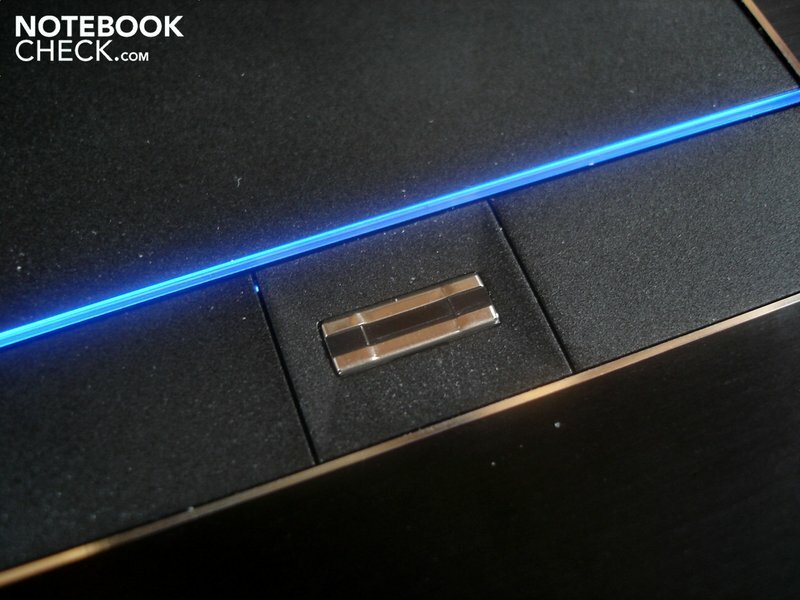 Unlike the touchpad, the keyboard isn't illuminated. In the meantime, a Kensington Lock belongs to the standard configuration. 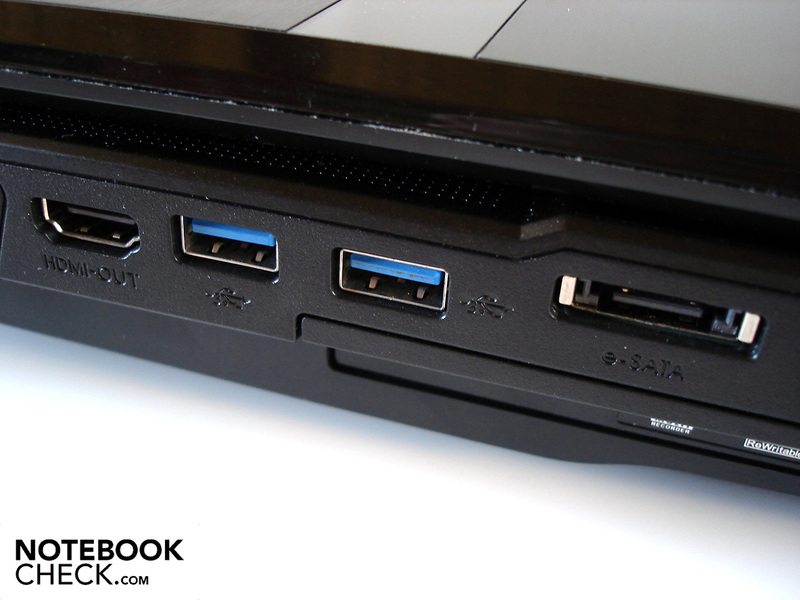 The right accommodates three USB 2.0 ports. 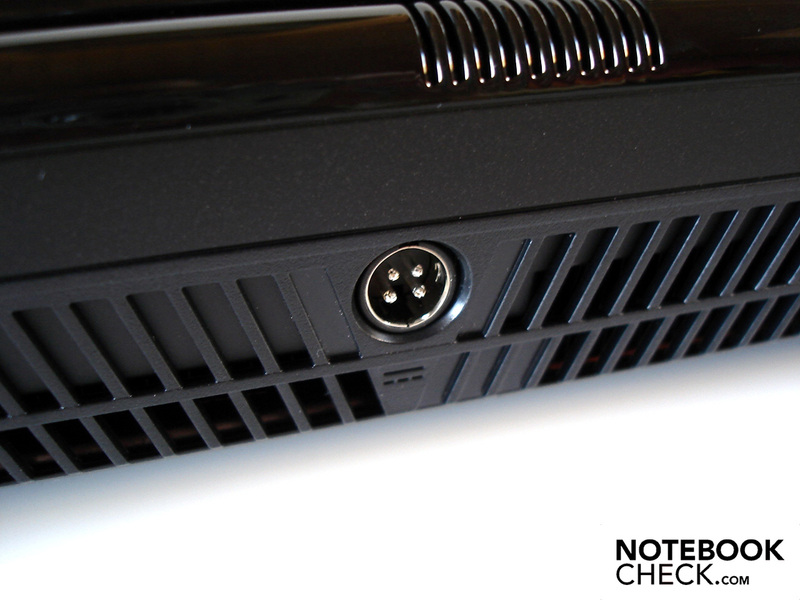 The audio sockets can transmit a 7.1 signal when required. The DC-in is located on the rear's center. 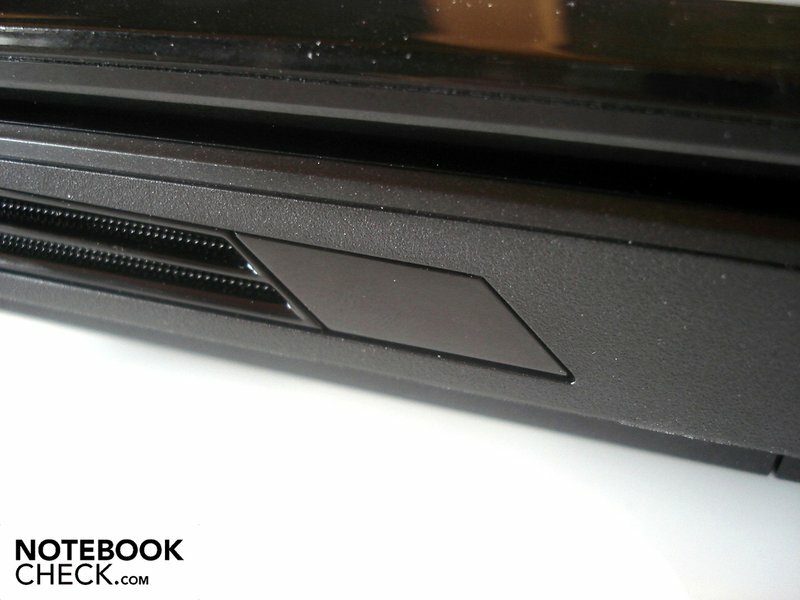 An infrared sensor is hidden on the front. Naturally, a few status LEDs shouldn't be left out. DVI, antenna and RJ-45 gigabit LAN have been place cleverly. 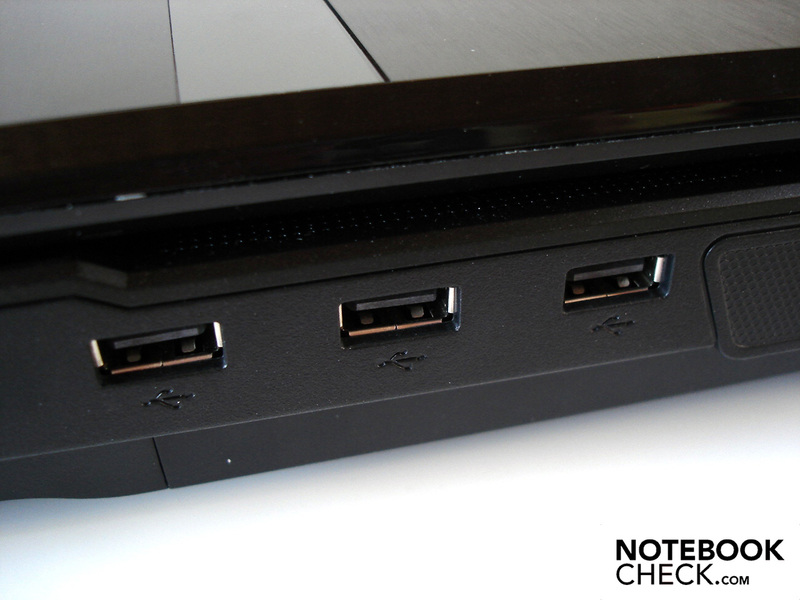 The X7200 barebone has two advanced USB 3.0 ports. The cardreader is capable of a total of nine formats. The case wobbles evidently without the inserted battery. The adapter (above) has turned out extremely voluminous. An average adapter (below) looks tiny in comparison. The round power button has a stylish design. 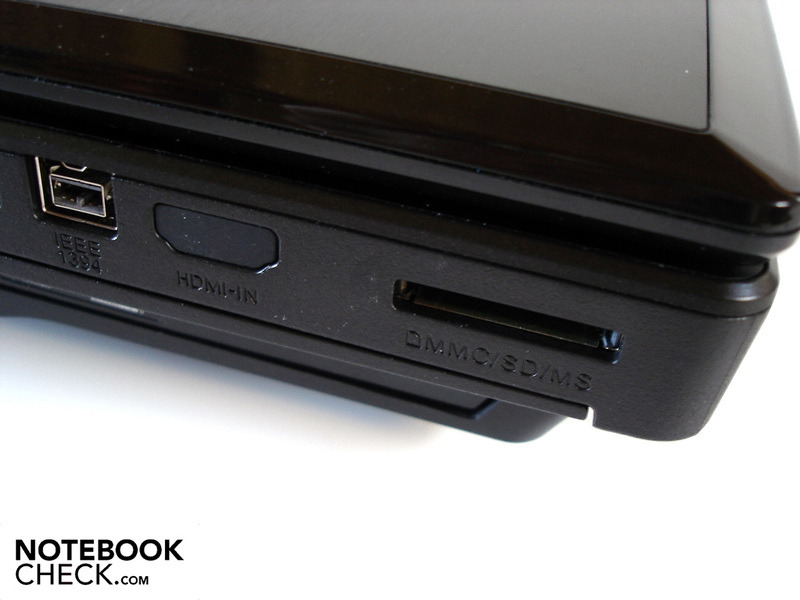 The HDMI-out transmits video and sound in high quality. The wrist-rest surface is generously sized. The case is extremely high with about seven centimeters. The maximum opening angle is a good 135°. The display lid is made of brushed aluminum. 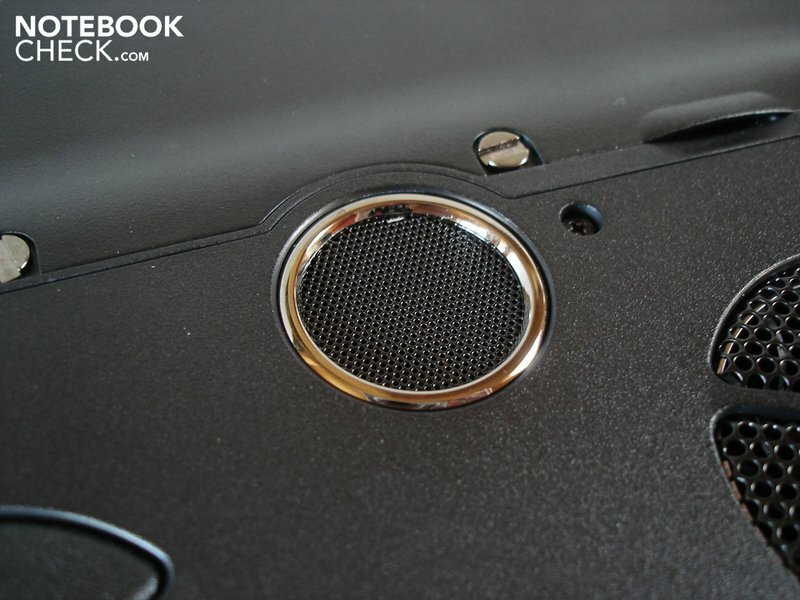 Apart from the battery, two covers can be removed from the case's bottom. 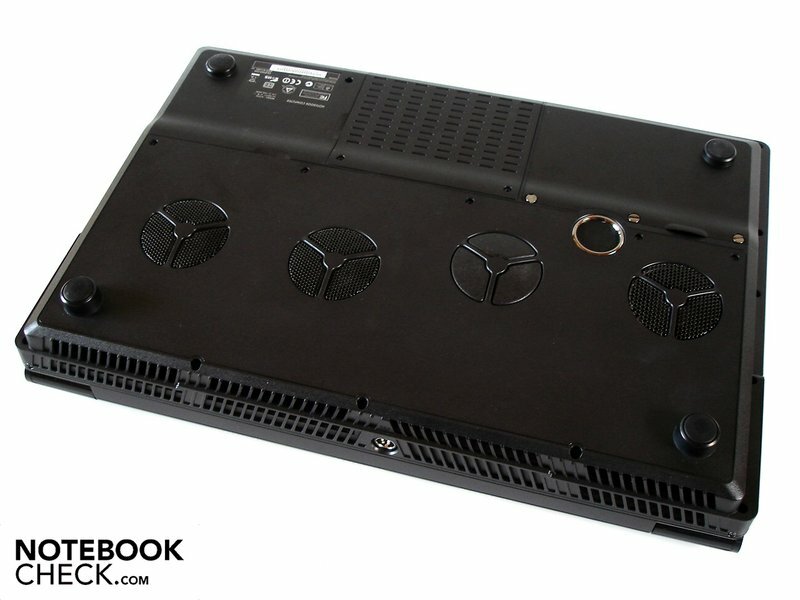 A total of four fans are responsible for cooling of the high-end components. 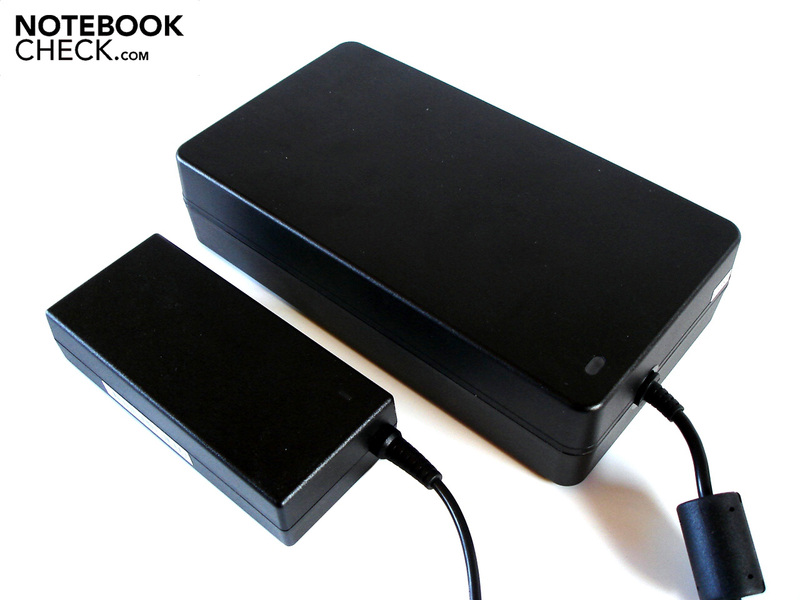 A total of three hard disks can be accommodated. Two GeForce GTX 460M graphics cards work in SLI mode. You can choose among HDDs, SSDs and hybrid hard disks. The soundscape is very high under load. 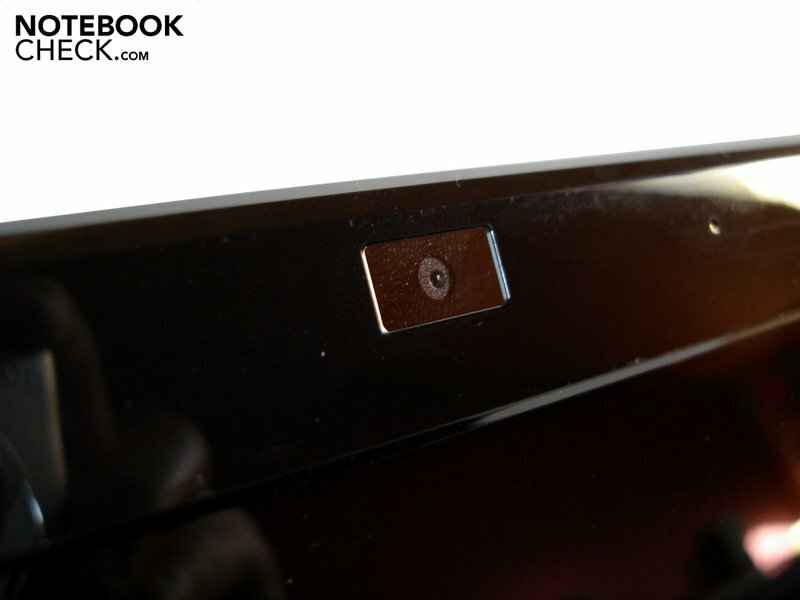 The installed webcam has a resolution of 3.0 megapixels. 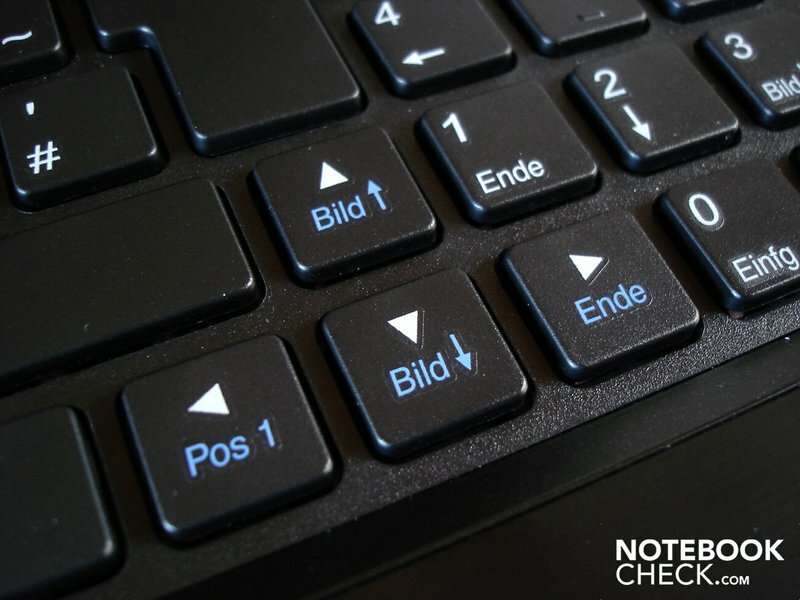 A touch-sensitive bar is above the keyboard. 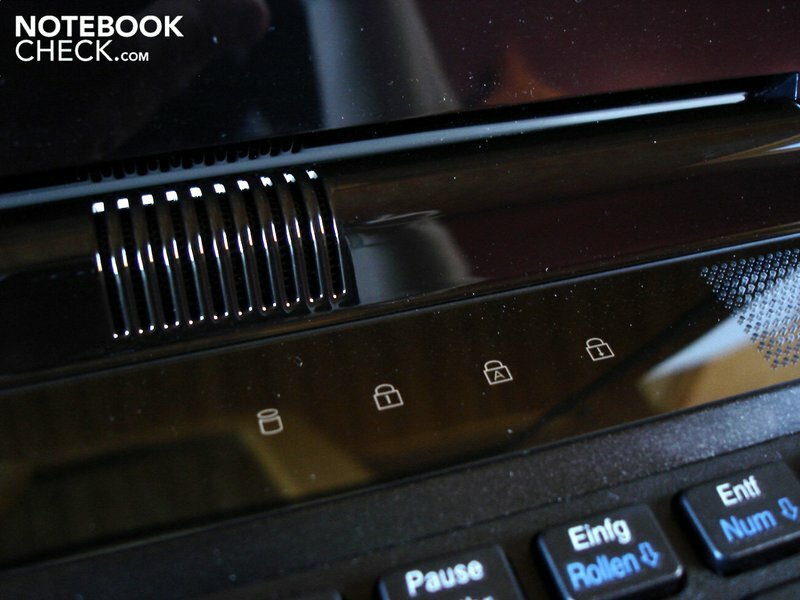 Bluetooth, WLAN and webcam are easily controlled. Unfortunately, Clevo hasn't used matt surfaces everywhere. The keyboard layout is very good. We quite liked the crisp type feel. 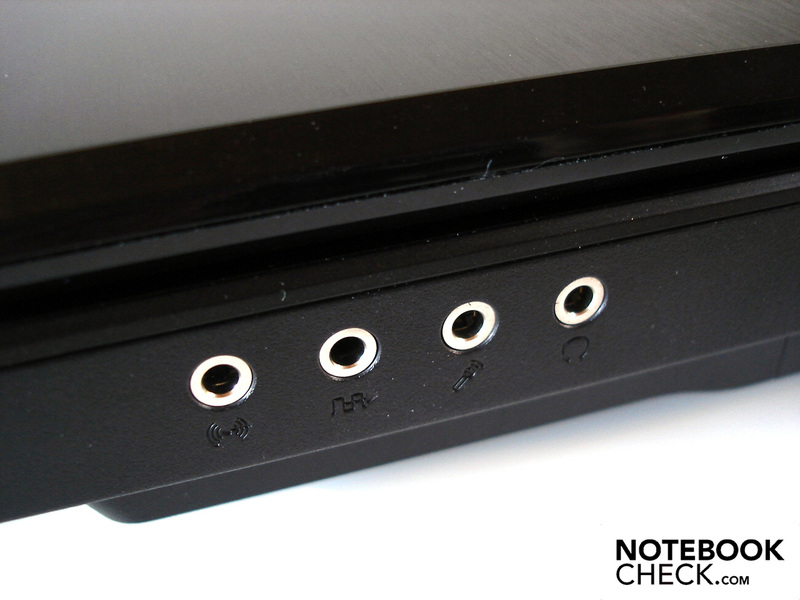 Five speakers are rather unusual in notebooks. Schenker includes quite a bit of software for the XMG U700 ULTRA. The application and gaming performance is simply awesome. A lower noise level and a higher mobility. The good image quality of the high contrast display. 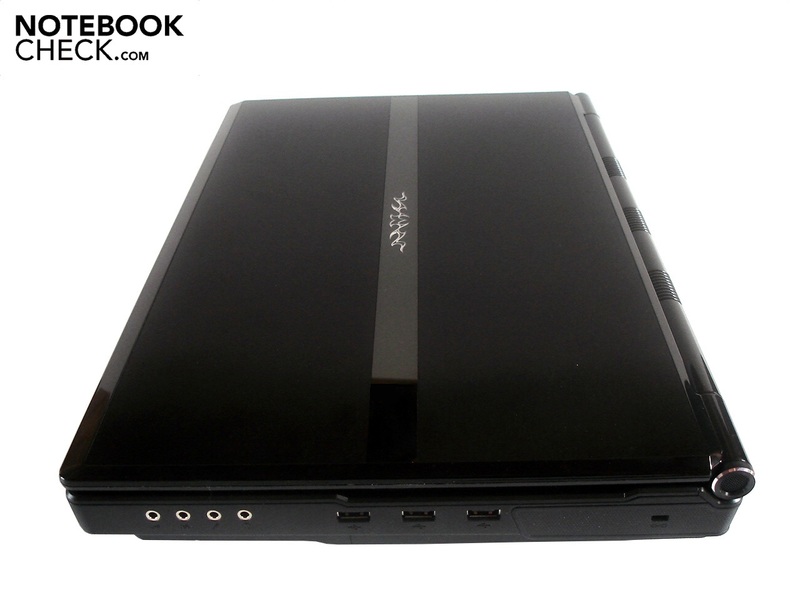 Other dual core notebooks, such as Alienware's M17x (HD 4870 X2), DevilTech's HellMachine (HD 5870 X2), DevilTech's HellMachine DTX (GTX 480M SLI) or mySN's XMG8.c (GTX 285M SLI).